i never thought i will be blogging about miley cyrus, EVER. but ever since i heard this song, i kinda like (= she's ok but only in this song) her. love the lyrics of the song too. sooo warm and soo fluffy. i usually don't blog so early in the morning but i went to work thinking i was planned for 9 am, and surprise, i should come at 11. I love this look. PErfect. THe fluffy big sweater and the shoe? wow! alm mo yun you look like walking outside the fashion week of paris. You should be snapped by those street style bloggers. But i love where you are now. Love the green background. I have seen this jacket in the shop and I was wondering HOW to wear it:) You did a good job with it! LOOL! I hate when that happens!!! Btw I love your swacket [jeje] and your hair OMG fab!!! Omg I am dying over that!!! LOVE your tights so much. Toller Look. Ich habe mit dem Cardigan auch schon länger geliebäugelt. Sieht super aus. You make me want to hug you! Great pictures!!! Love the sweater. Are you talking about the Miley Cyrus 'Party in the USA' song?? Because I've had that stuck in my head for THREE DAYS! & I do love it secretly haha. you have the most beautiful pictures ever. i love your tights! couture sweater! haha. it looks lovely. I love it! That swacket looks so comfy and the shoes are lovely with the black tights. Seems like a very nice sweater, it looks great on you! Hi swacket! Your swacket is so cool, and warm at the same time. LOL at going to work late. But a good breakfaast is more important! I have to have that sweater. I am fantasizing about what I could wear it with right now. Lol! But of course you paired it with that lbd beautifully! p.s. Thanks for the congrats! you look stunning and i love the detail on your sweater!!! great outfit! love your tights. looking through this pictures and your past pics, you rock girl! great sense of fashion. love that jacket. this h&m cardi is amazing! I want to purchase it too! PS: I like the entire look! Love your tights and that cropped cardigan, I love the cascading waterfall ruffles, a definite new obsession this winter! Total tolles Outfit, vorallem die Jacke! Und natürlich wieder super schöne Bilder! 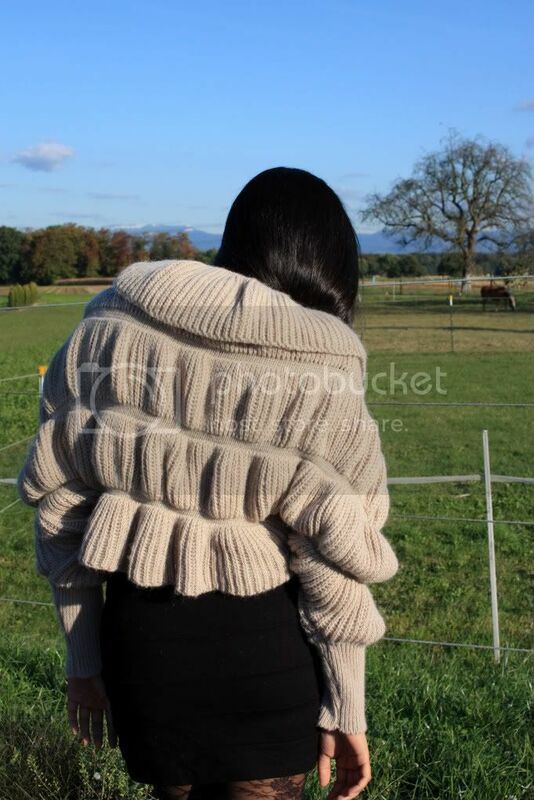 This is absolutely perfect... the chunky knit is killing me! I love it! love the whole look! where is that dress from?